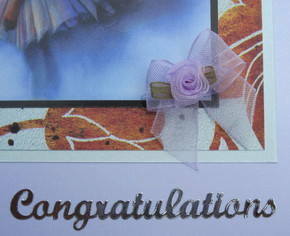 Soft lilac and pistachio card 148 x 198mm (6" x 8") with a beautiful picture of ballet dancers against a lilac and bronze background, matted onto pistachio and gold textured paper, trimmed with a lilac organza rose-trimmed bow. 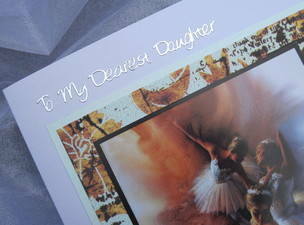 'To my Dearest Daughter', and 'Congratulations' are embossed in silver but you can request a different greeting or leave it blank. Please make your choice using the Personalise form.